The first floor of the Gardner House Museum contains a music room, a dining room, and four parlors. You may click on any photo below to view the gallery of photos for the first floor. 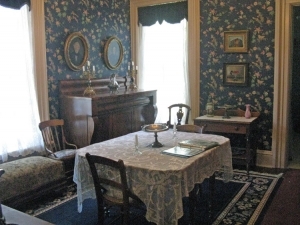 The South Parlor was host to many visitors and afternoon teas in the 19th century. You can almost picture it as you sit on the Victorian sofa. See the original fireplace and its marble base which came from the Albion Post Office. To the left of the sofa in this photograph is a portrait of Eleanor Thompson Peabody (1794-1877). To the right is a portrait of her husband Paul Tenney Peabody (1792-1856). The Peabody family arrived in Albion in March 1833, about the same time as Augustus P. Gardner. 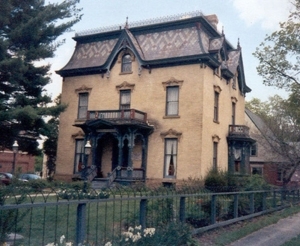 The Peabody home was torn down. Below Mrs. Peabody's portrait is a pump organ, which was recently restored. 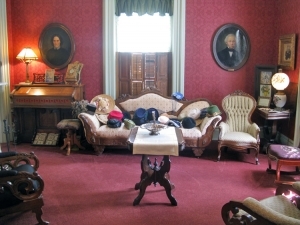 In this parlor, you'll also notice a chalk portrait of Albion banker James Sheldon (1830-1894), who married Paul and Eleanor's daughter, Mary. Near the doorway, marvel at the original stenciled wallpaper that was used in this room. As you walk into the North Parlor, you will notice on the far wall a picture of Juliet Calhoun Blakely. On Sunday, May 11, 1877, she came to the pulpit at the Methodist Church in Albion and preached about temperance. She also asked the congregation to honor mothers that day. Her two sons, who were traveling salesmen, were so impressed with her that they promised to return on the second Sunday of every May (her birthday being May 13) to honor her. They spread the word to their colleagues across the country and encouranged them to honor their mothers on the same day. Mother's Day was born. The lower chairs are considered to be fainting chairs. Due to the fact that women of that time period were to wear corsets and large dresses, they did have breathing issues that would cause them to faint. The chandelier is one of five pieces of a larger chandelier. Each room on the first floor has a piece that fits the other pieces to become one large chandelier from the opera house that was once part of the downtown. Not only will you be able to see musical instruments from the 19th century, you might be able to play them too. Tickle the ivory of a working piano, believed to have been manufactured in the late 1850's and restored in 1986. It was used in the Howard Building on South Superior Street, where many meetings, socials, dances and classes were held during this time period. The organ came from the old Methodist Church on E. Erie St. 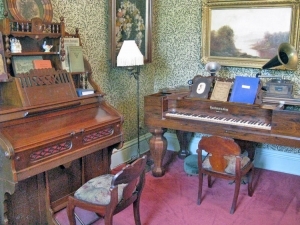 The footstool to the right of the organ originally came from the Augustus P. Gardner estate. The beautiful mirror in the Music Room was saved from the Peabody home before it was torn down. It measures nine feet high and 42 inches wide. You'll also admire an oil painting of landscape, painted in the 1870's. In the nearby hallway, you can wind up the victrola. In the dining room, notice the wallpaper. This wallpaper was based on a period piece. 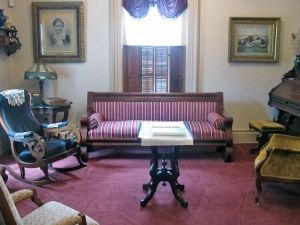 Above the bureau on the far wall, you will see more paintings of Albion's Founding Family, the Peabody Family. In the far corner is an antique highchair that turns into a stroller.